Affordable housing in Pune’s real estate market will soon be even more affordable. After the tremendous success of the similar offer in year 2016, more than 1000 flats got booked and the delivery of all flats is made now. 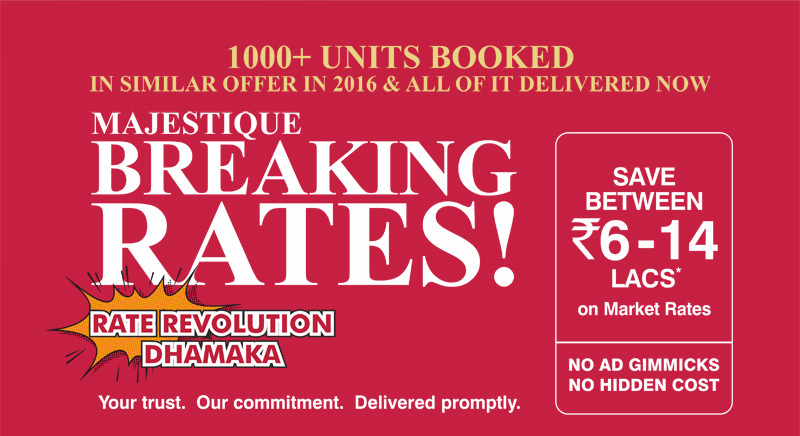 Majestique Landmarks is a leading name in affordable housing has come up with the revolutionary offer again. Here’s a chance to bag the opportunity with unbelievable savings from 6 Lacs to 14 Lacs for 1 BHK and 2 BHK flats in 4 projects at 4 locations in Pune. ‘Memories ‘ on NIBM Annexe. Majestique Landmarks are known for their beautiful projects with apartments that are within the budget customers. They always manage to come up with innovative world class amenities, special themes or other such features that render sophisticated and stylish look to their projects. Clear title properties and transparency in business dealings have won them trust and goodwill of their customers within the short span of time. More than 4000 happy Families are already staying in various completed projects. Even the above mentioned four projects have all clearances and certifications from the government and are RERA certifications. Overall, this is a pleasant surprise and a great opportunity for customers to purchase their dream home.